What is Confocal Laser Scanning Microscopy? Fluorescent microscopy not only makes our images look good, it also allows us to gain a better understanding of cells, structures and tissue. With confocal laser scanning microscopy (CLSM) we can find out even more. CLSM combines high-resolution optical imaging with depth selectivity which allows us to do optical sectioning. This means that we can view visual sections of tiny structures that would be difficult to physically section (e.g. embryos) and construct 3-D structures from the obtained images. The principal of confocal microscopy was patented by Marvin Minsky in 1957 but it took a good few years before it was fully developed to incorporate a laser scanning process. The technique essentially scans an object point-by-point using a focused laser beam to allow for a 3-D reconstruction. In a conventional microscope you can only see as far as the light can penetrate whereas a confocal microscope images one depth level at a time. The CLSM works by passing a laser beam through a light source aperture which is then focused by an objective lens into a small area on the surface of your sample and an image is built up pixel-by-pixel by collecting the emitted photons from the fluorophores in the sample. The CLSM is based on a conventional optical microscope but instead of a lamp, a laser beam is focused onto the sample (Figure 1). The intensity of the laser light is adjusted by neutral density filters and brought to a set of scanning mirrors that can move them very precisely and quickly. One mirror tilts the beam in the X direction, the other in the Y direction. Together, they tilt the beam in a raster fashion. The beam is then brought to the back focal plane of the objective lens which focuses it onto your sample. If your sample is fluorescent, part of the light will pass back into the objective lens. This light travels backwards through the same path that the laser travels. The effect of the scanning mirrors on this light is to produce a spot of light that is not scanning, but standing still. This light then passes through a semi-transparent mirror which reflects it away from the laser and toward the detection system. The first object in the detection system is the pinhole aperture, which is in the intermediate image plane of the microscope. This allows only a small central portion of the light through to the light detectors. If this is fluorescent light, it will be a different colour from the laser light, and emission filters are used to separate it from laser light that has been reflected from your sample. If reflected light is being examined, it will be passed through a polarizer that will allow only laser light with a different polarization angle from the initial laser light to pass. Any light that emerges from the CLSM’s optical system (Figure 1) may have a very low intensity, and so the photomultiplier tube (PMT) is used to detect and amplify this light signal. Photomultipliers are capable of amplifying a faint signal around one million times without introducing noise. The output from the PMT is an electrical signal with amplitude that is proportional to the initial light signal. This analog electrical signal is converted to a series of digital numbers by an analog to digital converter in the computer. As the laser beam moves along the specimen, the detection system constantly samples and converts the PMT output and displays them on the computer monitor in correct order. All of these complicated steps occur so fast that the display seems like it is showing a real-time image of the sample! The laser: Laser lines can be chosen via a selection device and are matched with the fluorophores used in your experiment. Beam splitter: This is a filter that separates the excitation from the emitted light in the fluorescence beam path of the microscope. Scanner: This is a unit based on two or more mirrors, which guide the focussed laser beam across the specimen, pixel-by-pixel and line-by-line. Objective lens: These are the heart of the microscope and mainly determine the optical image formation and the resolution of the system. Z-control: This allows you to focus on any focal plane within your sample and the motorised Z-stepper allows movement in the axial direction in small step sizes (>10 nm) with high precision. Pinhole: This is an adjustable iris in the intermediate image plane. It allows exclusion of most of the out-of-focus light from the acquired image and thus provides optical sectioning capacity. It defines the thickness of the optical slice and is dependent on the properties of the objective lens. The pinhole size can be set via the software on your computer and the best trade-off between the efficiency of light collection and optical sectioning is if it is set to 1 Airy unit (you can read about more about the Airy unit in this article). Photomultiplier tube (PMT): These are highly sensitive detectors that collect the photons emitted by your sample. They basically transform the light signal into an electrical one that is recorded by a computer. 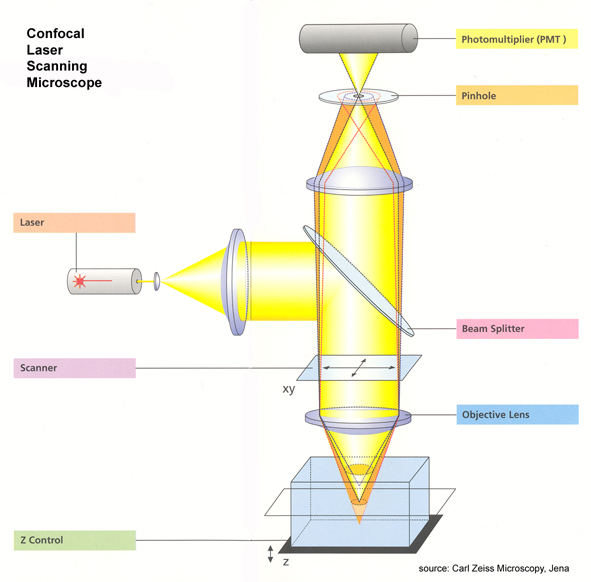 Figure 1: Confocal Laser Scanning Microscope Overview. Source: Carl Zeiss. As we see from the details above, the CLSM is a complicated technology with a lot going on underneath the surface; many different processes are happening quickly to give you the image you see on your screens. But once you learn how to use all the different functions, there’s no end to the images and data you can create. Happy confocaling (it’s not a word but it should be)! Very difficult to understand for a clinician but nicely explained . Where to send samples in Mumbai ? This was really detailed and very useful. For someone who only just started learning about this, it was very easy to understand.